In January, I discovered there was such thing as a one dollar development board based on STMicro STM8S103F3P6 8-bit MCU with 1KB SRAM, 8KB flash, and 640 bytes EEPROM, some GPIOs as well as I2C, UART, SPI, ADC, and PWM signals. Links to documentation and source code were provided, but development tools were only Windows based. However, one of my reader informed me SDCC (Small Devices C Compiler) supported STM8, and development in Linux should be feasible. So I decided to buy the board on eBay for $1.62, as well as an ST_link V2 programmer for STM8 / STM32 for $4.52 in order to flash the firmware. The board came pretty quickly, i.e. within 2 to 3 weeks. But due to a lost package, the programmer took nearly 3 months to reach me, as the seller had to re-send after I failed to receive it within 2 months. It comes with 4 wires that need to be connected to RST/NRST, 3.3V, SWIM, and GND. To do so, I had to solder a 4-pin header on the side of the board. To get started with STM8 on Linux, I found some information on ColeVision website where they explained how to run Drystone on STM8/128-EVAL board using SDCC as the compiler, and stm8flash to program the board. If you are using Ubuntu 14.10 or greater, you’ll already get the latest version. Great! stm8 is now present in the list of supported MCUs. So now you should be able to write simple program to control other GPIOs, I2C, SPI, UART with the board. But if your program is a little more complex a debugger could be useful, and there’s Texane STLink working on Windows, Mac, and Linux, that can run gdbserver for STM32… But I tried it for STM8. Hmmm, it does not look good, and sadly there’s no support for STM8 yet, as STM32 and STM8 use different interfaces (SWD vs SWIM). So if you have troubles debugging your program, you may have to revert to Windows based tools, at least for now, unless you’re up for the task and want to add STM8 support to Texane. I saw a AMS1117 voltage regulator on the back of the board. Does the chip runs in 3.3v or 5v? What is the USB port for? Reading the datasheet (quickly) seems to indicate that there is no USB device on that micro. Is it used for serial? If so, what’s doing the serial translation? Probably the USB is doing power only. It would be stupid for a manufacturer to have a USB stack on the chip, and not to use it in the bootloader to be able to reflash the chip with something else. I guess it’s running at 3.3V, because the board is still running if I disconnect the USB port, and only connects it to the programmer that only provides 3.3V input. Use openocd! Its so simple and so efficient! I actually used one of those stlink to flash a kinetis k10. There is a qstlink that is quite sweet as well. At least can run Super Street Figther 4? Great article. Just got my board and programmer in the mail, solder headers and I was good to go. Compiled a new version of sdcc on Linux Mint 13 and was able to compile your test program and flashed it. LED blinks! One question, how did you know B5 was hooked up to the LED? Do you have the schematic or did you just trace it with a multimeter? The docs on eBay points to a link where the documentation are all in Chinese. Thanks! I also double-checked with a multimeter, since other schematics connect the LED to PD3. There are also a few tutorials (led counter, UART, benchmarks) at http://colecovision.eu/stm8/, currently for two evaluation boards (STM8L-DISCOVERTY and STM8/128-EVAL); I hope I’ll find to get the versions for the other boards up sometime. Really nice tutorial! very helpfull for a starter/make everything works ok project. I have also verified that the LED is on pin B5 with a mutlimeter. but even if i change the registers in code my LED doesn’t flash. I am thinking that my board is dead, but writing with stm8flash seems to be done with no errors, i would expect that to not happen at all with a dead chip, right? Do you have any pointers on what i should check next? or maybe a different .c file that tests the chip functionallity? The LED test is one of the most basic test to check whether the board is working. I’d also assume you would not be able to flash a program is the board was dead. 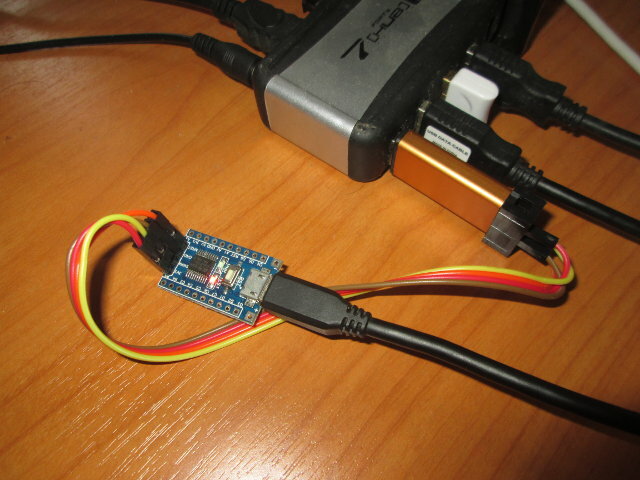 If you have a USB logic analyzer you could connect it to several GPIO to find if any other pin level is changed with your program. Maybe also check the datasheet if there’s some info about boot behavior, like a clock or something that you could check. I tried to maybe connect a new LED on A2 Pin, next to ground. Can you help me a bit on that? i also though of changing the problem a bit, and keep the B5 high all the time. Since i don’t own a logic analyzer ( yet ), maybe i can just keep it high and measure it with my mutlimeter? You could use a multimeter too to check the pin levels. Is there a way to programm this board without the st-link? No. You really need the programmer. It costs about $5. My LED also does not blink. Did you ever figure this out? Iv’e tested compiling and uploading with sdcc on Linux and Windows. Uploading works fine on both OS’s but the LED doesn’t blink. Iv’e ordered a couple more from Ebay and Ali-express just to make sure its not the board. I have seen at least two different schematics for this board with the LED connected to different GPIO pins. So it’s possible your board is slightly different from mine. You could always check which GPIO pin is turned on/off with a multimeter, or have the program turn on and off all GPIOs to check your board is working. Well I tested the LED and the red one is working but not the green one. So idk if thats the only problem or if there is more. I ordered 4 more from different places so I can confirm later when they arrive. Thanks for the tip. Because of the price I bought a STM8S board to. I’m started with discription on your website (and other websites too). In the first it was a good entry point, but I spend a lot of time to discover out, that the adresses declared in stm8l.h are different to the adresses for stm8s. This was find out by reading the reference manual. For the GPIO it doesn’t matter, but if you want to use the USART1, it won’t work for receiving datas. Another thing is the clock setup. In your example the STM8S the CPU is clocked by internal 2 MHz instead of internal 16 MHz because the adresses by example CLK_ICKR and CLK_PCKENR1 (and ohters too) are different. I checked http://openocd.org/ and saw no mention of the STM8 family, only the STM32. What can you use openocd for here please? Someone who can help me! Thank you! That was the problem. I have to look more closely at the messages. Thank you! I’ve never heard of versaloon, but looking at that page, it makes me think about the Black Magic Probe. ( https://github.com/blacksphere/blackmagic/wiki ). 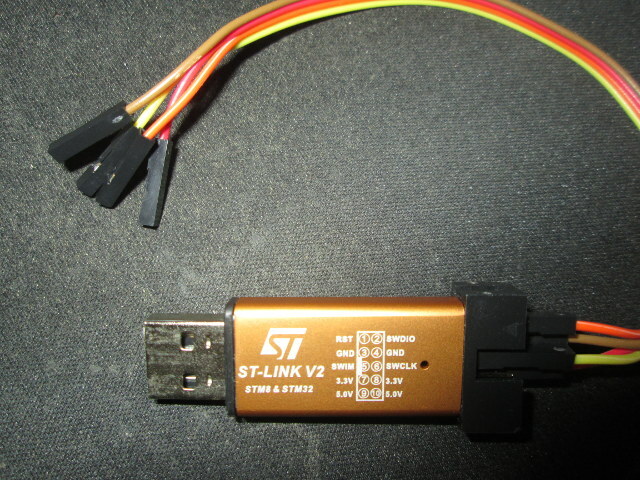 The firmware can also be flashed to the cheap ST-Link clones as in the picture in the article. However, there is no STM8 support, only ARM support. GDB directly connects to the Black Magic Probe, without the need of OpenOCD. However, even though GDB itself seems to work fine with BMP, I haven’t gotten eclipse to work with it yet.